Selective Antibiotics | Tamar Laboratory Supplies LTD.
InvivoGen is a leader in the production of selection antibiotics. Our state-of-the-art facilities allow us to produce large quantities of high quality antibiotics with purity levels exceeding 95%. As we manufacture our products, we are able to offer the best prices on the market. Ready-to-use Cell Culture Tested Solutions and Endotoxin Free – No weighing needed – Our antibiotics are available in solution filtered to sterility for customer convenience and validated for cell culture usage. 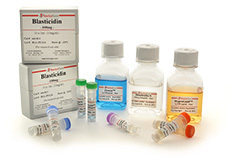 An Excellent Choice of Antibiotics for Selection in Both Mammalian cells and E. coli – Matches up to the antibiotic resistance genes carried by InvivoGen plasmids, built for selection in both mammalian and bacteria cells.